Bobby Maddex interviews Peter Schweitzer, a board member of the new Most Holy Theotokos Rescuer of the Perishing Orthodox assisted-living facility, located in Clearwater, Florida. Bobby Maddex interviews Cynthia Damaskos, the director of the Orthodox Speakers Bureau. Mr. Bobby Maddex: Welcome to Ancient Faith Presents…. 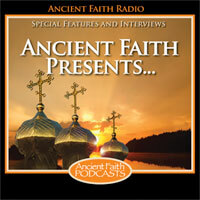 I’m Bobby Maddex, Operations Manager at Ancient Faith Radio, and today I will be speaking with Peter Schweitzer. Peter is a board member of an important new ministry called Most Holy Theotokos Rescuer of the Perishing. Welcome to the program, Peter. Mr. Peter Schweitzer: Thank you, Bobby. Mr. Maddex: Well, let’s begin with you. We’ve never talked before, so I’m eager to get to know you. I understand that you are a convert to Orthodoxy. Tell me a little bit about your journey. Mr. Schweitzer: Yes, I’m a former Catholic priest, ordained in 1993, and I left the active ministry in 1997 to marry. Then in 2011, my daughter, who had just started college, was taking a course in world religions. She came home one day and was all excited. “Dad, you’ve got to go see this monastery. It’s you.” So she invited me to church the next day with her class, which was going to an Orthodox Liturgy. So I went with them. I wanted to meet her professor and some of her friends. I walked in and fell in love. I knew from that moment I was to be Orthodox. Mr. Maddex: All right, so what jurisdiction are you a part of now, and where do you live? Mr. Schweitzer: I’m in the Moscow Patriarchate, and I live in Seminole, Florida. Mr. Maddex: Seminole, Florida, and we’re going to talk more about Florida here in a second, because that is where this ministry is located. Now, I assume you do not work for the ministry full-time. What is your day job? Mr. Schweitzer: Actually, I own my own business. It’s a marketing consulting online webmarketing firm called PMC Writers, Pinellas Management Consultants. I create websites for companies as well as do their online marketing: their social media, their blogging, all their content creation. Mr. Maddex: Excellent, so as I mentioned, you are on the board of what sounds to me like an amazing and very much needed ministry, and it is called, again, Most Holy Theotokos Rescuer of the Perishing. So what is this ministry, and where is it located? Mr. Schweitzer: The ministry is located in Clearwater, Florida, just north of me. It’s in the Tampa Bay area of Florida, and it’s just south of downtown, right near a major hospital, about half a mile from Morton Plant Hospital, the major hospital in the area. We’re collaborating right now with an existing assisted-living facility. The owner of the facility has given us a space for a chapel, which Bishop John of the Moscow Patriarchate blessed two Sundays ago, and we have room for ten Orthodox residents. Mr. Maddex: So who started this ministry, and why did they feel like it was needed? Mr. Schweitzer: Well, a bunch of us got together, mostly priests and myself, because we had been hearing stories of elderly people being neglected, they’re alone, they’re cut off from the parish, they’re not receiving the sacraments, their families aren’t around. There are three specific stories, really. The first is very positive, and it relates to a Greek Orthodox monastery in Florida, just north of Ocala. The father of the abbot there had decided to join his son in the monastery. He had been diagnosed in the terminal cancer, and he came to live there, lived the last part of his life. And as he was dying, I was able to visit the monastery and see how the monks took care of him, and it was moving. They spent 24/7 with this man. They not only fed him, they prayed with him, prayed for him, they took the Eucharist to him. They really cared for him, and the love and concern that I saw and that I witnessed there really made a great impression on me. The second thing that happened, two parishioners—well, actually, one parishioner—reposed, and we didn’t even know about it. Her relative brought her cremains into the church. Of course, you know, that’s not something that’s part of our tradition, and it saddened us. We’re thinking we knew this lady was elderly, but we didn’t know she was even sick. We knew her well enough to know she was a pious Orthodox Christian, and this isn’t the way she would want to repose. The [third] story was a Greek Orthodox man, a young man in his 40s, who had fallen into a semi-comatose state and was in a nursing home in St. Petersburg, and my priest found out about it and asked some of us to go visit him, and he was in a nursing home. The conditions were deplorable. I’m not going to name the nursing home, but the conditions were absolutely deplorable. He was all by himself. The parish, which is located in Tampa—parishioners would travel from Tampa to St. Petersburg to pray with him, and the priest anointed him, communed him when he was conscious, and anointed him. He died, or reposed, on Palm Sunday, and the priest at the parish in Tampa called the monastery out in Arizona, St. Anthony’s Monastery in Florence, Arizona, and asked if they would arrange burial for him. So this man who was basically all alone in life—no family, no friends, no community—at the last moment of life, spent with Orthodox Christians and was given a proper burial, not only in a sacred ground, but the most sacred ground for us: a monastery. With those three occurrences, I thought, we have to do something. Too many of our folks are dying without the holy mysteries of the Church, without the love and support of Orthodox Christians, without the community. And they’re in situations that really aren’t good for them; they’re not optimal for them. So I took it upon myself to contact some of the local priests. We knew it would have to be a pan-Orthodox effort to be successful. We needed Greek representation, we needed Russian representation, we needed American representation, Serbian representation. So all of us came together, and we worked very hard, not only to find a place, but to create a life in this house for these people, and that’s how we started. Mr. Maddex: As you mentioned, you are partnering with an existing assisted-living facility. And congratulations to them for being willing to do that with an Orthodox group. What can you tell me about that existing facility? Mr. Schweitzer: It’s a 32-bed facility. The man who owns it I’ve known previously. Actually, when I was a Catholic priest I started a free medical clinic, and he was on the board. So I had a relationship with him. Originally I had just gone to sit down with him to pick his brain, to say, “This is my idea. How do I do it?” And he immediately jumped and said, “I’ll help you. I’ll reserve ten rooms for you, and you can start there. If you take off, perhaps we can talk about your ministry purchasing the entire building, and run it as an Orthodox assisted-living facility.” We’re not there yet, but that’s our hopes and plans for the future. Mr. Maddex: That’s amazing, Peter, and, as I’ve said, you are one of the board members of the Most Holy Theotokos Rescuer of the Perishing Assisted-Living Facility. What are your roles in the ministry other than being a board member? Mr. Schweitzer: I’m basically the one who’s been coordinating. In terms of setting up the chapel, we had to get doors on the chapel. We had to cut a deacon’s door out of a wall. We had to arrange for all the liturgical items. We needed an altar. We needed a prothesis table. Crosses, icons. I did some of that, but I’ll have to tell you, the altar and the prothesis table, as soon as I voiced a need, one of the other board members, a priest, came through. He found an altar from a monastery in Ocala and a prothesis table that they had been using for the last ten years, with all the altar coverings, so it was like manna from heaven. Mr. Maddex: Well, in addition to having this chapel and the amazing fact that you can have people who are in an assisted-living community and can, right there on the premises, take the holy Eucharist and be part of Divine Liturgies and vespers and things like that, which is sufficient enough, but what other types of services does the ministry provide? Mr. Schweitzer: That’s an excellent question. We’re going to make it, for lack of a better term, a full-service house. We’re going to have all the hours. We’re going to start with the midnight office and then matins, first hour, third hour, sixth hour, ninth hour, vespers, and compline. And we’ll have molebens and akathists. So it’s really going to be a house of prayer and repentance so that those who choose to, just about any hour of the day, the chapel is going to be used for prayer. There will be people in there praying for themselves and praying for the other house members and praying for people who have reposed. Mr. Maddex: That’s so amazing. I’m only 46, but I’d like to go ahead and reserve my spot now if that’s possible. Mr. Schweitzer: Absolutely! We’d love to have you. Mr. Maddex: [Laughter] All right! Why do you think that a ministry such as this is so important? You’ve touched on this a little bit with the three stories that you shared, but perhaps you could elaborate a little bit. Mr. Schweitzer: Absolutely. I think part of it is we’re in a strange land in terms of Orthodoxy. We’re not in Greece, we’re not in Russia, we’re not in Serbia, which are traditionally Orthodox lands. The general culture thinks quite differently of death. In fact, they call it death; we call it repose, which tells you there’s some differences there. The general culture doesn’t like to talk about death. At all costs it avoids it. In fact, when someone does repose, they speak about having a celebration of life. They don’t want to talk about a funeral or death. And we don’t mind talking about someone’s repose, because we know there’s another life; there’s a life after this one that’s eternal. And we have to prepare for that. And ignoring that we do so at our own peril. So there’s time in life when we are to live our fullest here, but there’s also a time when we need to prepare for the next life if we haven’t been doing it all our lives. So this really gives Orthodox Christians an opportunity to prepare for their own repose, pray for family members, pray for those who have preceded them in their own repose. I think this is absolutely crucial. We just don’t have that, at least in the Tampa Bay area. We’re not going to fear this; we’re going to face it, because of the hope in the resurrection, but we also have to take responsibility and be prepared, and part of that is living the full Christian life, which, God willing, is what we’re going to do at Most Holy Theotokos. Mr. Maddex: Well, Peter, I have to be honest. This is the first such facility that I’ve heard of that is Orthodox in the fashion that you’re talking about. Are there other ones out there, and do you foresee these sorts of assisted-living facilities spreading throughout the country? Mr. Schweitzer: That’s an excellent question. There are other assisted-living facilities, nursing homes, out there, but I think what we bring to the table that’s a little bit different is our emphasis on the spiritual, the notion that the house is to be a house of repentance and prayer. That’s something a little bit unique. The way this whole ministry was put together, it’s designed to be replicated. So if someone in Los Angeles, California, wants to do it, we could show them how we did it, and they could take it and bring it to Los Angeles, or wherever—Wichita—wherever it’s needed. This is something that can be replicated throughout the country. Mr. Maddex: Awesome. And what can listeners, our listeners right now, do to either assist your efforts or actually to take advantage of the services that you provide? Mr. Schweitzer: Well, that’s a good point. Anyone who is at the point in life where they would like to prepare, we’d love to have them. We welcome them with open arms. This is not just something where we’re taking people from just Tampa Bay or just Florida; we take people from all over the country, all over the world. Anyone who’s an Orthodox Christian, who expresses a desire for this life, is more than welcome. So that would be the first thing. And we’d welcome them with open arms and love. Secondly, if people who are not quite ready to make that decision, they can help us with financial contributions. That information can be gathered from our website, and we can take donations online. Mr. Maddex: What is that web address? We can also be sure to include it in the description for this episode. Mr. Schweitzer: Sure. It’s theotokosrescueroftheperishing.org. Mr. Maddex: All right. Well, Peter, I thank you so much for taking a brief amount of time today to tell me about this wonderful ministry. I’m very excited about it personally, so glad that something like this exists and truly do hope that it does spread and that maybe someday there’ll be one here in Chesterton, Indiana. Who knows? Mr. Maddex: Is there anything else that you’d like to add before I let you go? Mr. Schweitzer: I’d encourage people to visit the website, and especially spend some time looking at what we call the Holy Myrrhbearers Society, which is a program put together for those who have reposed. We didn’t quite have time enough to discuss that, but I think that could be quite intriguing for parishes who can’t do the ALF portion, but they may want to look at the Holy Myrrhbearers. That’s something that every parish could do right now. Mr. Maddex: Go ahead and tell us a little bit about the Holy Myrrhbearers. It sounds fascinating. Mr. Schweitzer: I stole the idea from Fr. Josiah Trenham, who’s doing it out in California in his parish, St. Andrew. He’s an Antiochian priest. It’s a group of men and women who get together once an Orthodox Christian has reposed. If it’s a man, the male team gathers, washes the body, anoints the body, and prepares the body for burial, and then also accompanies the body with prayer: psalms are read up to the point of repose, and really up to the point of the funeral. Then afterwards, they ensure that that person is prayed for 40 days, the 40-day commemoration, and afterwards. That’s a crucial aspect that every parish could do right now if they want to start something. We’re incorporating it into Most Holy Theotokos Rescuer of the Perishing as part of our services. Mr. Maddex: Wow, Peter, this all sounds so phenomenal. I thank you so much for coming onto the program with me today and talking about Most Holy Theotokos Rescuer of the Perishing Assisted-Living Facility. Mr. Schweitzer: Thank you for having me. Mr. Maddex: All right! So, once again, I’ve been speaking with Peter Schweitzer, and he is indeed on the board of the aforementioned organization, the assisted-living facility down there in Clearwater, Florida.